The full form of QBASIC is Quick Beginners All-purpose Symbolic Instruction Code. QBASIC is the most popular high-level programming language. 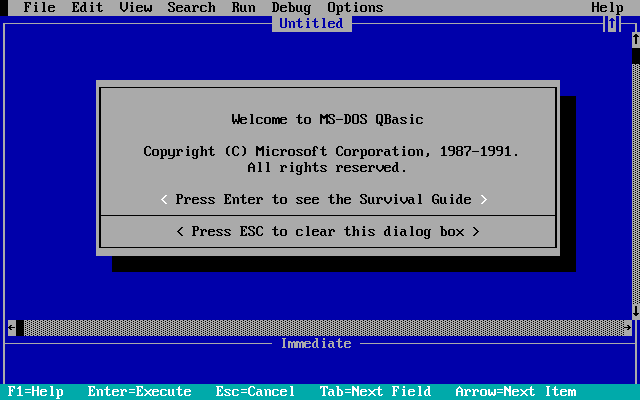 Various versions of BASIC have been developed by Microsoft Company. This language is quite simple to understand and has been adopted by most of the microcomputers. It is suitable for both mathematical and business problems. It is compatible with MS-DOS environment and it has two basic files QBASIC.EXE and QBASIC.HLP. We can edit, debug and execute the program using these two files. QBASIC is easy to learn and fun to practice program. It may be called a "People's language". It is available almost for every computer from micro-computer to mainframe. Therefore, a program developed in a micro-computer can run on a bigger system with minor modifications. It is suitable for mathematical and business application. Modification of the program is quite easy. Click on start button and get DOS prompt. Change the directory to QBASIC. QBASIC is the most popular high-level programming language. QBASIC is easy to learn and fun to practice. It may be called a "People's language". Modification of the program is quite easy by the help of Qbasic. What are the advantages of QBASIC? It is available almost in every computer from micro to mainframe. Therefore, a program developed in a micro can run on thebigger system with minor modifications. Modification of a program is quite easy. QBASIC is the most popular high-level programming language developed by Microsoft which is very easy to learn and develop programmes. List any two basic files used in QBASIC. Which of the following is not the advantages of Qbasic? Modification of program is quite easy. QBASIC does not distinguish between an ______ . Which of the following is called a "People's language"? QBASIC is also called ______. Any Questions on 'Computer Programming in QBASIC '?